If your order weighs less than 13 ounces, save huge on shipping with USPS first class (with tracking number). This product weighs 9.8 oz. 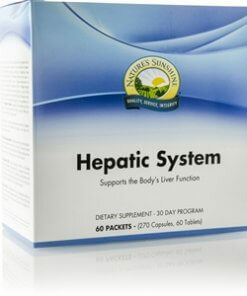 Nature’s Sunshine Hepatic System Pack is a 30 day program to support and nourish the liver. Products in this pack aid in the detoxification process and help remove toxins from the body. 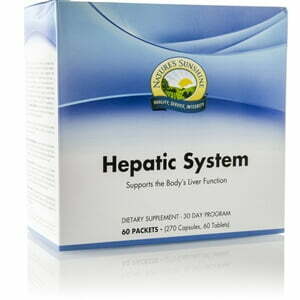 Provides nutrients and antioxidants that support and protect the liver and its functions. Silymarin, found in milk thistle plant, helps the liver produce cells and guard liver cells against toxins. This Chinese formula features bupleurum, which is thought to help detoxify and replenish the liver and to aid in the upward flow of chi, thereby strengthening the body against stress. This formula supports circulation, digestion and general energy. Psyllium is soluble fiber with a remarkable ability to absorb water and bowel toxins. It may also help maintain already-normal cholesterol levels in the bloodstream. Instructions: AM packets contain 2 Milk Thistle Combination tablets and 1 Liver Balance TCM capsule. PM packets contain 6 Psyllium Hulls capsules. Take the contents of one AM packet with breakfast. Take the contents of one PM packet with your evening meal and one or two large glasses of water.